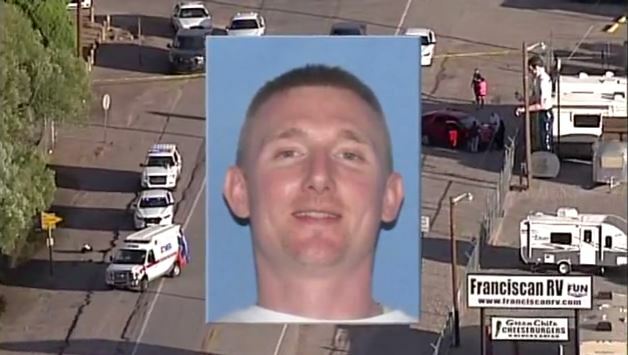 HATCH, N.M. - An Ohio fugitive wanted for murder has been arrested in the fatal shooting of a New Mexico police officer. Dona Ana County Sheriff's spokeswoman Kelly Jameson says that 38-year-old Jesse Hanes is suspected of gunning down Hatch Police Officer Jose Chavez, 33, during a traffic stop Friday. Hanes fled and is suspected of carjacking a man at a rest stop before shooting him in the stomach. The man's condition is unknown. Authorities say the deadly confrontation began when Chavez pulled over Hanes, who was driving a luxury car with two passengers, in the village of Hatch, about 40 miles northwest of Las Cruces. A fellow officer who arrived to assist Chavez said he saw him holding paperwork and reaching for his service weapon before he was shot and fell to the ground. Hanes then fled on Interstate 25 at speeds up to 100 miles per hour before stopping at the rest stop, authorities said. Sheriff's deputies spotted Hanes in the stolen vehicle and pursued, slowing it down by deflating the tires. The suspect crashed the vehicle into a pile of wood and briefly barricaded himself in the car before surrendering to deputies, Jameson said. The suspect had a gunshot wound to the right thigh which appeared to be self-inflicted, she said. CBS Albuquerque affiliate KRQE reports witnesses say that after the police shooting, one of the suspects was seen approaching motorists and demanding their keys. Witnesses say when one driver refused to go with the suspect, he was shot in the torso once. The victim was transported to a trauma center in El Paso. Their condition is unknown. Hanes' two passengers also were arrested. However, KRQE reports one of the men who was in the car when the shooting occurred is reportedly a hitchhiker and is being treated as a witness, not a suspect. Chavez, who was shot in the neck, died at University Medical Center in El Paso, Texas. He had been an officer with the department for two years. Jameson said she doesn't know why Chavez initiated the stop. Hanes was wanted in Ohio in the July 25 shooting death of a 62-year-old man just outside Chillicothe, about 60 miles south of Columbus. A bulletin sent out three days later by the Ross County Sheriff's Office in Ohio said both Hanes and another suspect, James Nelson, were believed to have fled the state and were armed and extremely dangerous. It warned that the two men have a violent criminal history. Hanes was 16 and living in Columbus when he pleaded guilty in 1995 to involuntary manslaughter and other charges. He was sentenced to prison and released at 32. He went to prison again in 2014 after pleading guilty to robbery and was released in April 2015. Nelson, who also goes by "JD," has a string of drug-related convictions in central Ohio dating back to the mid-1990s. The Chillicothe Gazette in Ohio reported Saturday that Nelson was also taken into custody in New Mexico on warrants in the July 25 shooting death of an Ohio man. However, the Dona Ana County authorities have yet to identify the two people arrested with Hanes. Hanes remains hospitalized and has not been booked. The FBI is assisting in the investigation, and authorities plan to hold a press conference Saturday.